With the exception of annual test tournaments like the Six Nations, playoffs determining title winners are pretty much commonplace in senior rugby these days, though no doubt the debate over the need for them will continue for years to come. Some hold the view that the team with the best record over the course of a given season should be crowned champions, and some may say their view has been vindicated by the fact that in three major tournaments this season - the Premiership, the Top 14 and now Super Rugby - the team that lifted the trophy was ranked as low as fourth. Personally I’m still on Team Playoff. Of course there’s the obvious good excuse in that the extra matches produce extra sheckles, but for me there’s more to it. These sudden death matches at the end of a campaign tend to raise the level of intensity enough for us to classify it as a different class of rugby to the bread-and-butter of the home-and-away fixture schedule. And our friends in the southern hemisphere have of course come up with a perfect phrase to describe that level - "finals footy". When it’s playoff time there’s no need to muck around with bonus points or points difference, no need to concern yourself with what’s going on in other grounds. It’s just you and your opponents - one of you will play again next week, the other won’t. Unless of course it’s a final when you get to run past the trophy you’re chasing as you take to the field...there really is nothing like it and more often than not when you simply award it to the team atop the ladder we’re deprived of all of that. There can be one downside to the high stakes however...a much more cautious approach than during the season. With so much on the line, nobody wants to be tagged with a headline-making mistake, so more often than not we end up with a tense chess match, especially in the early stages. Saturday’s Super Rugby final had an 8:30am kickoff time here in Ireland...not everyone would have been willing to sacrifice their hard-earned lie-in to be there from the very start. 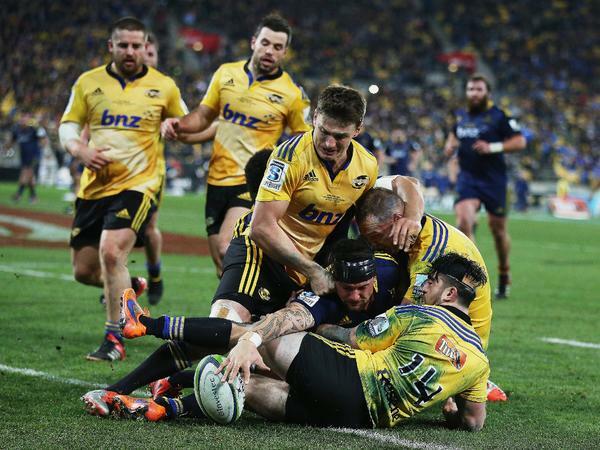 And if you didn’t get to tune in until around the 30-minute mark of this encounter, given the scoreline at the time was Hurricanes-0 Highlanders-6, you’d be forgiven for assuming that it was exactly that kind of cautious “finals footy” for half an hour. Well you absolutely positively could not be further from the truth. Despite the low score these two teams went for it literally from the kickoff and it was compelling rugby you just could not look away from...not only because of the offloading and support running but also, in fact possibly even more so, because of the the defensive intensity which met it. I’d almost go as far as saying that despite the fact that the Hurricanes were thwarted in possession several times deep in the opposition 22 throughout the match, I’d think twice before resorting to the cliché “white line fever” - the general level of organization on D was just too good more often than not, on both sides. So when that’s what you’re up against, it boils down to which team can manage to actually take their chances, and with the Highlanders winning the try count 2 to 1 and the Hurricanes winning the missed-placekick count 3 to 1, you could say “there’s the ball game”. For me the first three significant passage of play came towards the end of that opening half an hour I mentioned earlier. It began when Beauden Barrett missed his second kickable penalty of the half...it really must have been a blow to the Hurricanes not to be on the scoreboard yet at that point...they had two-thirds of the possession but like I said, kept being denied by the plucky Highlanders. So when the visitors’ won a penalty on the halfway line shortly after the miss, one which Lima Sopoaga nailed with room to spare, it may have represented “just” a six-point swing but had to give the 'Landers their first real notion that this could be their day. But the Hurricanes hadn’t won 15 of their previous 17 matches this season by accident and while it took them 35 minutes to cross the whitewash, when Ma’a Nonu finally dotted down in the corner, their own supporters may have felt there were floodgates about to open, though Barrett missing the conversion kept them behind on the scoreboard. You’d definitely forgive the Highlanders for wanting to stick the ball up the jumper after that score and get into the dressing room with a one point lead but you’d be forgetting that they were busy setting about re-defining “finals footy”... Right from the restart they piled the pressure on the home side, so much so that it seemed as though it was the Hurricanes who were happy to see out the half - and they would have too, only for Elliot Dixon cranking his already-notable performance up to “man of the match” level. First he pinched a Canes lineout in their 22 - that would have been impressive in itself, but a few phases later after a well-timed pass from Aaron Smith, Dixon not only took the space it provided but also took at least four Hurricanes with him to the try-line before somehow reaching out and dotting down. Or did he? It seems to be the subject of much debate and since the try was converted and the final margin was seven points, it’s a significant debate. Well here’s my take. On first look at normal speed, it’s definitely a try for me. Well - he certainly didn’t do his cause much good with his own reaction - as the NZ commentators noted, you have to at least try to “sell” your effort whether you think it was good or not and he most certainly didn’t. Still...from where I was sitting there was plenty of evidence to go to the TMO with the question “is there any reason not to award a try?” and when you view the footage with that in mind it’s hard not to assume his pressure on the ball at the very least disturbed the tip of a blade of grass even after making contact with Milner-Skudder’s foot. I guess what I’m trying to say is that the effort he put in leading to the score makes you want to give it to him...and while you can’t exactly say that in the Laws of the Game, I believe there is enough wiggle room there to give him the nod. I can totally appreciate if fans based in Wellington weren’t fully on board with that opinion though! After Barrett finally found his kicking boots to start the second half narrowing the gap to 5, Dixon was involved yet again in his side’s second try. After spurning two penalty advantages in and around the Canes 22 they created the space out wide and though Dixon could have probably made the line himself he had the presence of mind to ship it to his winger Naholo (who moments earlier forced the turnover that started the attack) who powered his way over and there were no doubts about this finish. 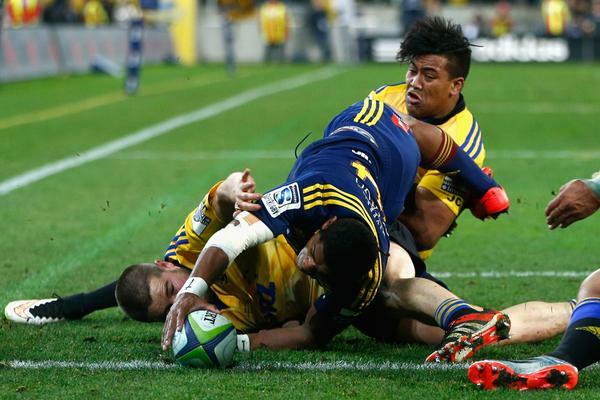 Then it was time for Sapoaga to miss a placekick and when Barrett pulled the margin back to 7 at the 54th minute mark, you felt the contest was far from over yet while the Hurricanes never stopped going for a second try, it seemed beyond them, especially when Julian Savea dropped a pass with the line at his mercy (on second thought this may have been a mild dose of white line fever!). As the second half progressed and the Highlanders built themselves a lead worth taking home, their approach to possession evolved to a point when it was definitely a more traditional form of “finals footy”. And who would blame them? For me they were just as impressive seeing out the final ten minutes as they had been all season with their positive approach to the game and whatever about the fourth-place finish or suspect Dixon try they are worthy champions. When you look at the preliminary All Blacks training squad for the World Cup, there are more Hurricanes on the list than Highlanders, yet with a championship on the line at the “Cake Tin” they were better than their opposition LITERALLY from jumper 1 through 23. Loosehead prop Edmonds was part of a solid front row while Marty Banks replaced Sopoaga for those final minutes and even sealed the win with a drop goal. Next week our Monday match writeup will feature the clash between South Africa and the Toulon World XV.